So why was it so great? Well, for a start, prior to leaving I’d been working on completing the reading & understanding of some Special Letters. Following this, I would be assessed to see if I’m ready to be given the gift of a special technique of meditation. I was looking forward to going to Sayla because I was eager to start mediating but I had the mindset that whether I was given this gift or not, the stay would be extremely fruitful anyway. If, on the other hand, I was lucky enough to learn the technique during this trip, I’d have over a month to work on it whilst being amongst an amazing set of Souls. To sum it up; it gives you the chance to improve in a variety of ways. There are no distractions unless of course you create some for yourself! Being in Sayla allows you to form good/better habits, whether it be in terms of allowing yourself to reflect, to act on things that come up, curb less desirable reactions/attitudes/patterns of thought, create new patterns, become disciplined and so on. The list of things that you can achieve when you’re there is HUGE! Of course being in Sayla means you get time with Bhaishree as well as the team of Self Realised Souls who want nothing more for us than for us to be happy. Truly happy. I had the opportunity to ‘drop in’ to Lalita Masi any (reasonable) time I wanted! This gave me the scope to ask her questions, she would explain the meaning of Letters, poems etc. in a way which I’d not been privy to before, she’d ask how my spiritual journey was going and advise accordingly. It was great! Now, that leads me to Bhaishree. What can I say? When Bhaishree explains Letters in Svadhyays, he has a knack of making it simple, light, (sometimes) humourous but always incredibly clear and appropriate for us to be able to reflect on the message, understand it and then apply it. It was somehow (positively) different to being present when he does Svadhyay in London. However, regardless of the venue, it was great! I was also there for Paryushana. Now there’s a bit of history about this… In my teenage years and before, I used to go and stay with my Grandparents & family during the Summer Holidays and Paryushana used to be around that time. 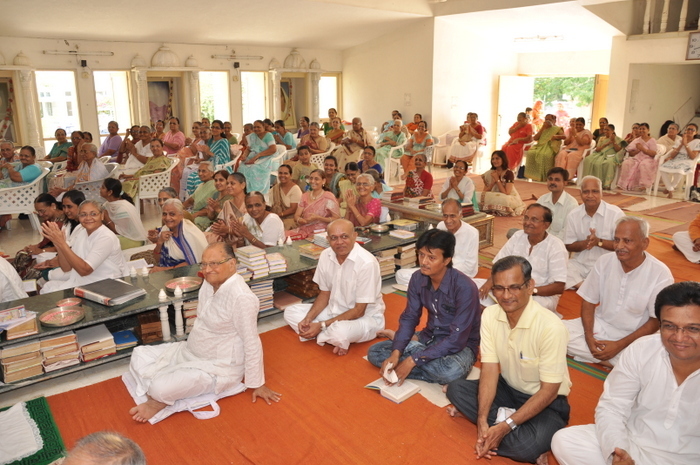 So I’d go to the Derasar (Jain Centre) with them, I’d do Pratikraman & I’d attend events before and after Pratikraman. However, although I was part of it, I didn’t really know what I was doing or why. In a nutshell; I grew up, went onto further Education, went to work and soon after that my Father passed away. This is when I stepped back from most things which I knew. After I got over all that, I decided to re-engage with the ‘wider world’. One part of this was taking my Mum to listen to Pravachan during Paryushana. This is when a learned person would talk about various things which would help us live a ‘better’ life. 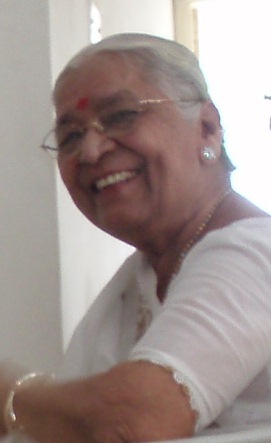 One of the ones we went to had a speaker called Haribhai Kothary. After listening to him I was hooked! Everything he said made sense in away which I’d not experienced before! Then I became interested in Paryushana again but I wanted to understand what I was doing better. I attended one Pratikraman a couple of years ago which was explained in English and that was great! However, other than that, I’d not really been part of Paryushana since. This was either due to time, mood or not understanding the speakers because my Gujarati wasn’t good enough. All of this changed in September 2012 when I was part of Paryushana in Sayla. It was amazing! 🙂 There were so many people doing it together and the vibe was positive, supportive, generous and more. Thanks to Vinu Kaka, we had access to a book which enabled us to follow what was being said and there was just a great feeling about it! I’d love to go to Sayla during this time again. If this has inspired you to find attend Svadhyays in London check out Raj Saubhag UK here. Interesting article. I am intrigued by what you are tought to be the path to self-realisation by Bhaishree. Can you shed a little light on what you believe is the path that is layed out by Bhaishree? Also, can you elaborate on what it means to be “given the gift” – is it that you are given some detailed tuition on how to meditate correctly, or are you given the gift in some other way? Re the ‘gift of meditation’ – yes, it’s a technique which is taught. one thing that struck me as slightly amiss from your article though is regarding the decoration of the murti’s which you described as “beautiful”. 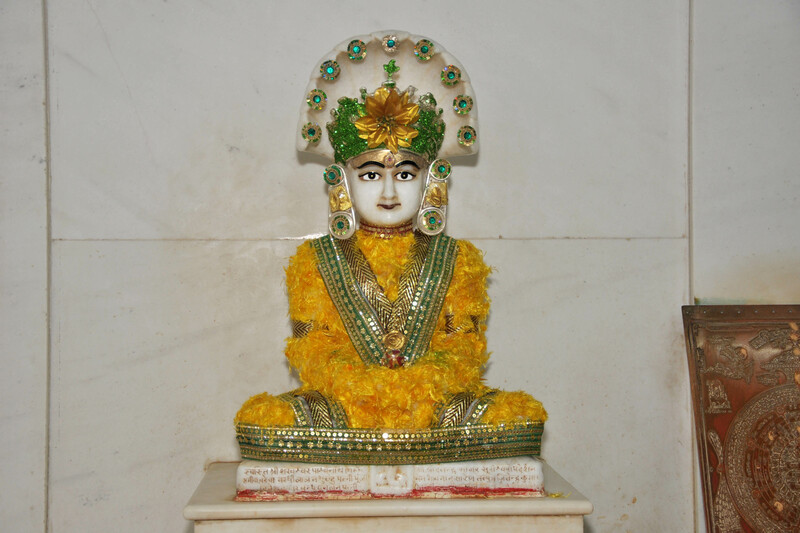 I don’t quite understand how the decoration of a murti can be a good thing…. 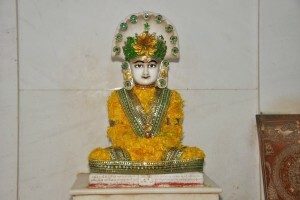 arahant bhagwan has 100% given up all worldly things, including clothes. Should the representation of bhagwan not depict this purity at all times? Surely by decorating, you make it difficult to focus on the bhagwan’s true nature, and are instead drawn to and distracted by the colours etc. of the decorations (which can only result in raag). Why dress bhagwan with that which he has worked so hard to renounce? 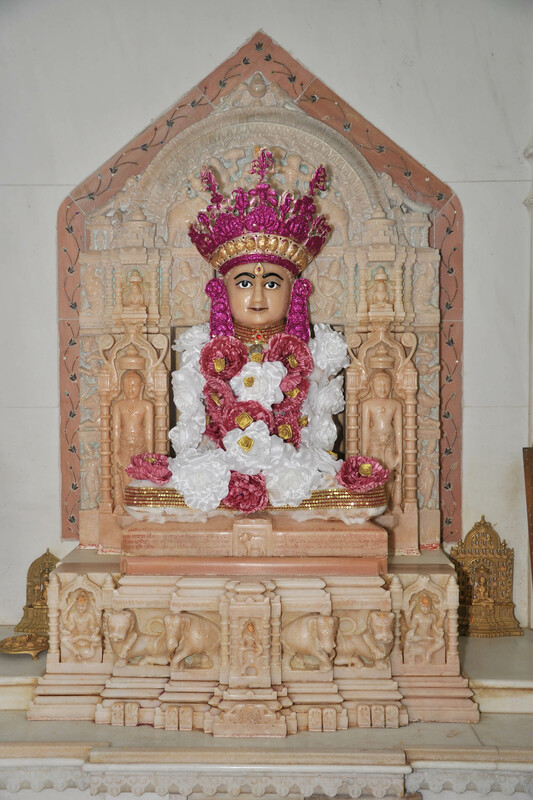 Just an observation that I hope does not offend – I just seek an explanation for this practice, since to me it seems contradictory to the basic principles of Jainism. Your point is perfectly valid – The Lord Tirthankars had renounced everything including all materialistic possessions. And so to decorate their idols with colourful materials is seemingly contradictory. 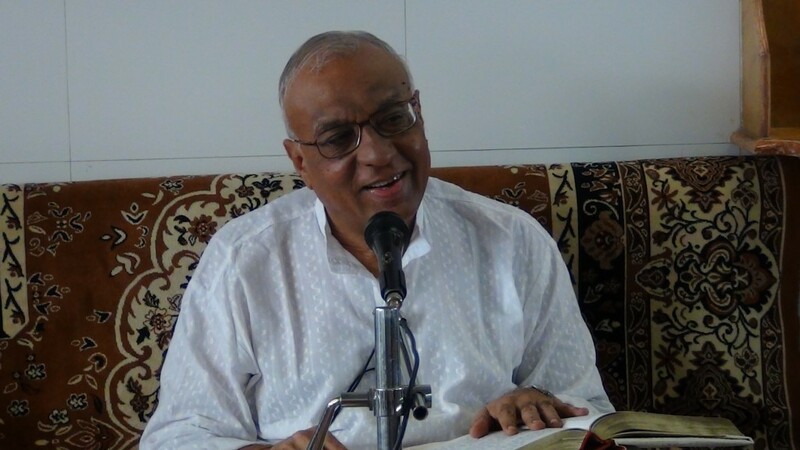 However this and several other religious practices are done with two reasons in mind – to draw new aspirants minds to the path, and to celebrate our own joy at having attained the shelter of Bhagwan. 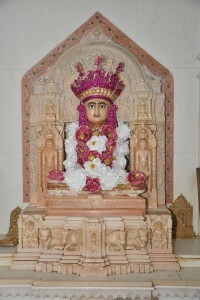 By decorating idols and Derasars beautifully , many people are drawn to the celebrations and this may at some point arouse a curiosity in them to dig deeper and find more about their inner achievements. Also we decorate Bhagwans idol to express our own joy, in just the same way that when Bhagwans walked the earth, hundreds of heavenly beings and humans would walk with them and hold golden umbrellas above their head, or lay out golden pedestals in their path for every step they take. But from an absolute perspective you are right, instead of focussing on the decorations of a Tirthankars idol we should be focussing on their inner qualities and all the great spiritual success that the idol is a representation of. Infact some people take it to an even higher level and completely abolish idol worship of Tirthankars (like the Sthanakvasis) – why attribute a physical form at all to those who stood for nothing but soul-awareness! Thanks for the detailed and informative response. It has shed some light on this practice for me. Nevertheless, I still wonder about the appropriateness of such a practice. But the practice in the article isn’t really done in the “same way” as what happened in the presence of the actual bhagwans…. i.e. when the arahants sat in meditation (in which case their bodies were exactly the same as the idols we worship – i.e. 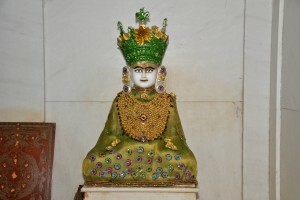 completely still like a statue) no heavenly being or human would think to dress the body of the arahant in celebration. If they did, surely they would be commiting a big sin. I can understand the decoration of the temple, but surely the purity of bhagwan unadorned should be a powerful enough visual to engage the eye of any aspirant – new or old. Totally respect your beliefs, just sharing my personal views as something for you to ponder over.